The AYSA Annual Board Meeting is Monday, January 7, 2019 at 6:30PM in the Howard Johnson’s 401 Russell St, Hadley, MA 01035. Thank you to Howard Johnson’s for donating the space for us! This is the meeting where officers and board members are voted into office. If you are looking to run for a position, or if you would like to join the Board, please join us on January 7. Several of the current board members will be stepping down. We will need community members to step up in order to continue the running of the organization. Please consider joining the AYSA Board! For questions, please email our President, Sam MacLeod. Thank you! This entry was posted in News on December 22, 2018 by aysamgr. Congratulations to the Undefeated Grade 8 Boys Team! 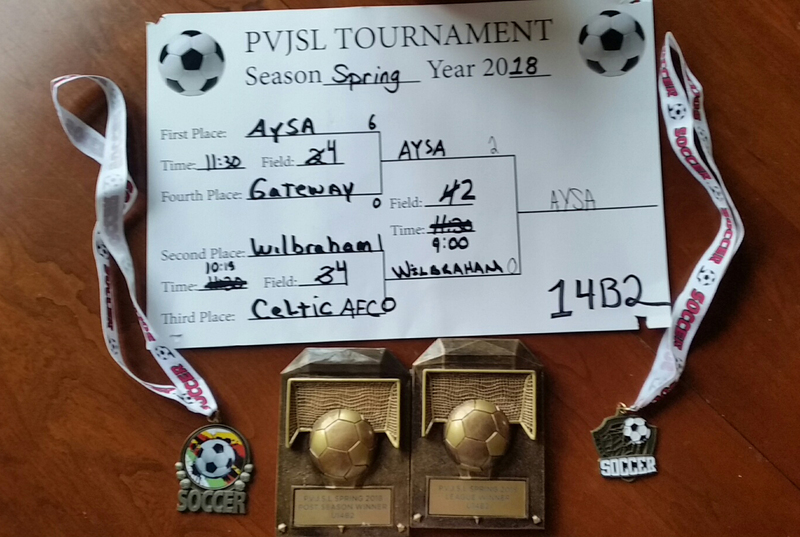 Congratulations to the AYSA Grade 8 Boys 2018 Spring Team for an undefeated season! 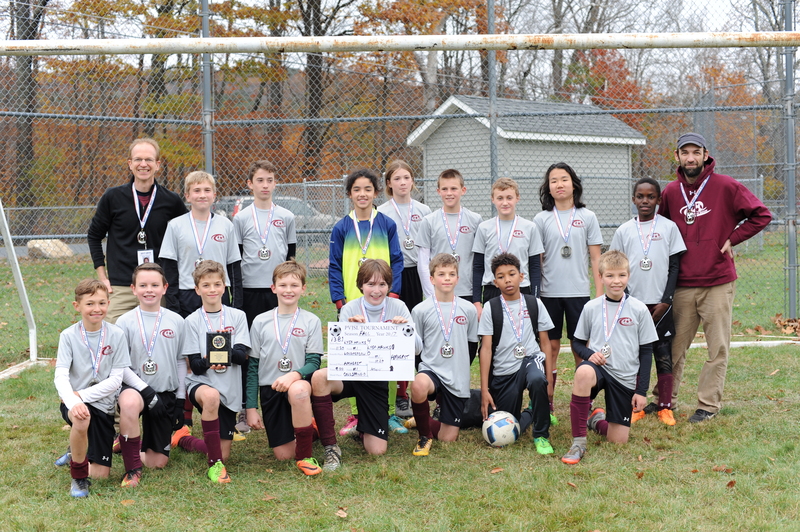 This season they have won the PVJSL Grade 8 Boys Post Season Tournament Championship. Thank you to their coaches, Head Coach Sam MacLeod, Assistant Coach Jon Wooley, and Chris Kingston, for providing inspiring and excellent leadership and mentorship. This Team’s 8th graders will be moving on the high school soccer with most playing in the Pioneer Valley High School Summer Soccer League. This entry was posted in News, Travel Program on June 21, 2018 by aysamgr. I’m writing to let you know about our AYSA Gear Recycling Exchange Program and with a specific request. Our request is that everyone please take a few minutes at this time to look for your old or no longer used pairs of Cleats (including indoor foot gear for next winter), Shin Guards, Jerseys, Goalie gloves, etc. for donation to AYSA. We want to get this going quickly so families will have access to the items in time for the season. Below is a link to the program details. Just contact us at the email or text below and we’ll make arrangements to get your items. We’re looking for all types and sizes. We’ll be following up soon with an inventory listing of available items and how you can acquire them (For Free!). I hope that this is something everyone will take part in as it will benefit our community in multiple ways. Not only will we extend the use of items but we will also provide the opportunity to lower the expense of participation. Soccer is a great sport but it can be expensive. Anything we can do to lower the costs associated with participation will be worthwhile. I’ve looked through my house and found six old pairs of of my son’s cleats that are not being used! They are going on the list of available items. How many items do the rest of us have? Again, please take a few moments to see if you have anything to contribute as we need your assistance. Just let us know and we’ll take care of the rest. Let’s get this going! This entry was posted in News on March 23, 2018 by aysamgr. 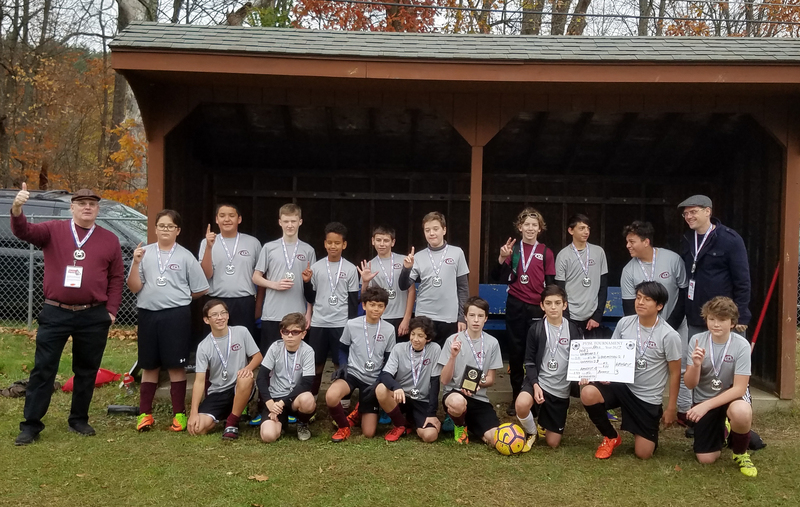 Congratulations to the Grade 7 boys division 1 (below, left) and Grade 8 boys division 2 (below, right) teams, who both won their respective post-season championships! All AYSA teams eligible for play-offs (grade 5 and up) playing in PVJSL made the play-offs. The Grade 5 and Grade 6 boys division 2 teams lost in the finals. The Grade 5 girls and boys division 1 teams lost in the semi-finals. This entry was posted in News on November 6, 2017 by krisztinafilep. We have been notified by a neighbor of Plumbrook Fields, that people driving to and from Plumbrook Fields are driving too fast and dangerously on Potwine Lane and surrounding streets. We have a LOT of participants playing at Plumbrook fields at the same time. This is very dangerous situation and we need to change this behavior immediately. When you are driving to and from Plumbrook fields, we need you to drive the posted speed limit or slower if there are a lot of other cars and pedestrians on the road. When driving in the parking lot, please drive very slowly as there are a lot of children in the parking lot. Enter the parking lot from the west entrance and exit from the east exit. Keep the flow of traffic going one direction, west to east. Only park in marked spaces and make sure you are parked between the space lines. Do not take up more than one space. We have a lot of families who need to use the parking lot at the same time. Due to limited parking space availability, please consider carpooling with other families and only bring one car per family to Plumbrook. You can use Crocker Farm’s parking lot to leave extra vehicles at. Do Not park on the grass or along the street. Emergancy vehicles must have the space to drive down the street if needed. Safety is our number one priority. These rules must be followed at all times. Police will take notice otherwise. The town owns and manages the fields. We must comply with what the Town and the Police have requested of us. Thank you for your cooperation in this very important matter. This entry was posted in News on October 24, 2016 by aysamgr. It is highly recommended that snacks containing peanuts or peanut oil are not brought to the soccer field. There are a few players who are so allergic to nuts that just smelling them can send them into a life-threatening allergic reaction. Individual coaches will announce this to their teams and parents/guardians who have children who are allergic should make sure the coaches and other parents know of the seriousness of the situation. This entry was posted in General on March 20, 2012 by cainmatt.